On a prime stretch of the Southern California coast, architects Sharon Johnston and Mark Lee of Los Angeles-based firm Johnston Marklee have built a new standard of beach home. 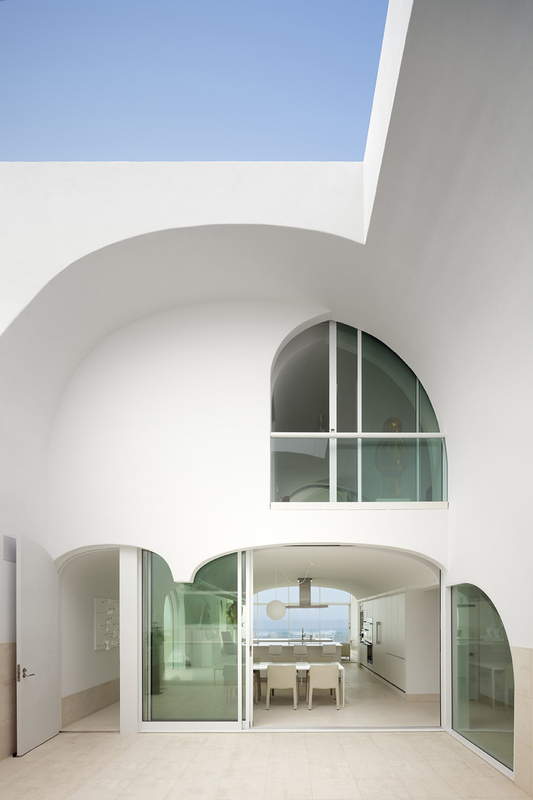 Part monolith, part abstract sculpture, the structure offers ocean views from every room in the house, while skylights and cut-out arches flood the entire interior with natural light. Crowded together in deep, narrow lots, beachfront houses usually boast a seaside panorama at one end, with dark and view-less interior rooms crowding the other end. Challenged to break this mold, Johnston and Lee created a series of stacked,vaulted rooms within a simple solid mass. 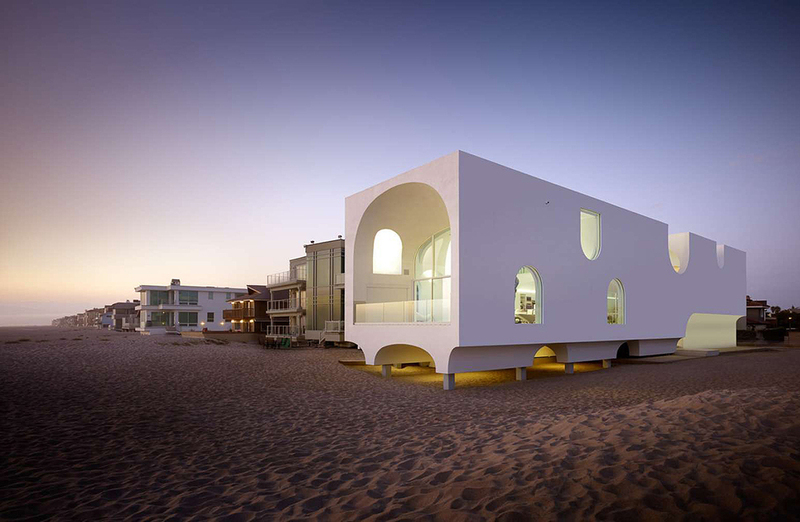 Each room features unidirectional arches and windows, which open up continuous, overlapping views of the oceanfront. By working some serious real-estate magic, they were allowed to build six meters closer to the surf than the neighbors, making the view totally unencumbered, and totally enviable. The exterior of the home is a smooth, white, rectangular block, cut through with arched windows and skylights on the sides. 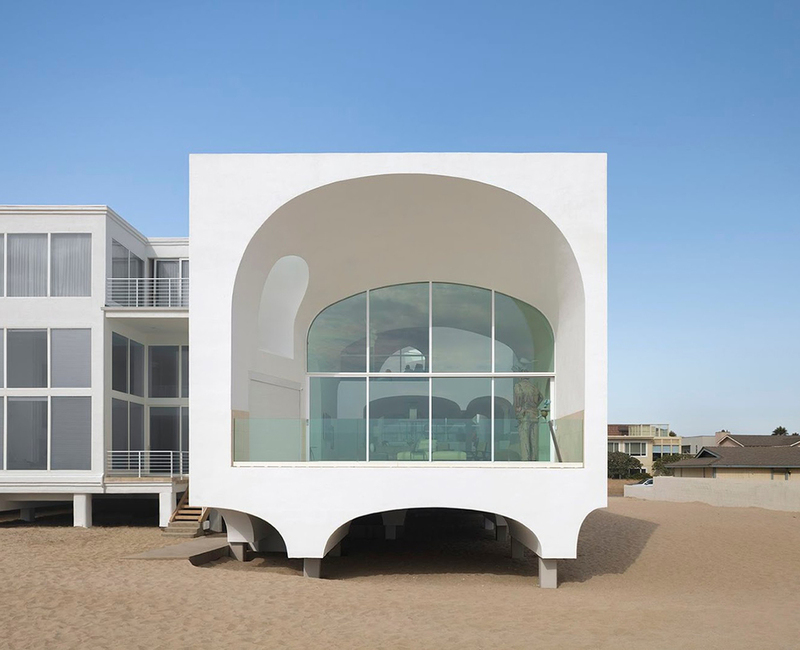 A huge covered balcony graces the business end of the structure, in which the main panoramic window is housed, allowing the beach itself to practically inhabit the living room. In addition to the parallel orientation of the rooms, a key architectural strategy to filter the maximum amount of natural light to the interior was to place a courtyard in the center of the building. The sheltered patio acts as entryway, and allows sunlight to penetrate into the deeper recesses of the house. Despite it’s imposing shape and solid quality, the vaulted underbelly of the house makes it appear to perch lightly in the sand on dainty feet. The whimsical illusion is of course supported by massive underground pylons, designed to withstand the destructive waves and weather that can come as a cost for an idyllic beach landscape. Coastal building regulations actually resulted in some of the pleasing asymmetries, and the shifting levels of the home, as the intrepid architects designed around the rules. The Vault House of Oxnard, CA is defined by sculptural forms, pervasive light, and of course, the magnificent, multifaceted oceanfront views. The architects of Johnston Marklee may have built their own version of a great white whale, but their obsession with artistic, and radically unique homes such as this one will certainly keep their modest studio afloat in a sea swimming with larger firms.